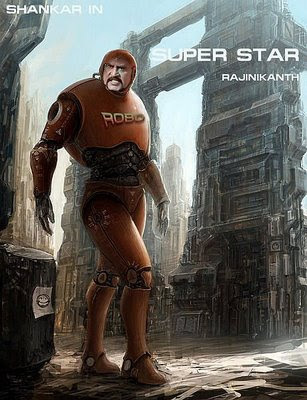 There has been a buzz for the past couple of weeks about Superstar Rajini acting in Shankar's Robot. This has become official now with Ayngaran International CEO Rohan Manickavasagar confirming the news. Says Rohan Manickavasagar and Eros Multimedia will be jointly producing Robot featuring Rajinikanth and directed by Shankar. The formal agreements will be signed soon.As far as ‘Robot’ is concerned, it is like a roller coaster ride for the movie, as Shankar has been contemplating with many names for his dream project. First it was said that Kamal Haasan would act in it. Then Vikram name surfaced. Post Sivaji, we heard that Hrithik Roshan would be the dream hero. Then came the name of Aamir Khan. Finally Shankar made an official announcement that it would be Shahrukh Khan, who would don the role in his most intimate project.If Shivaji was shot on a 80 Crore budget, the movie Robot will be produced on a 100 crore budget by Ayngaran International and Eros Multimedia. The sucess team of Shivaji which includes Shankar, Rajini and A.R. Rahman are all set to repeat their magic again in Robot. The rest of the crew needs to be still decided. This is going to be a never seen before Sci-Fi thriller for the Tamil audience. Nice take on video games.